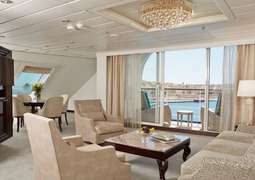 Regent Seven Seas Cruises are a glittering example of luxury ocean cruises and aboard the Seven Seas Navigator you will not be disappointed. 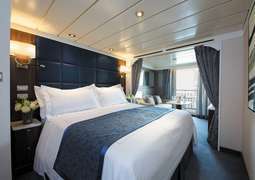 The suites on the Seven Seas Navigator are between 28m2 and 99m2 in size, have windows or balconies, a walk-in closet and safe as well as every amenity you could ever desire. The mini-bar is restocked with high quality beverages daily. 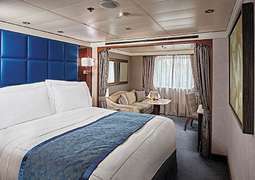 The four gourmet restaurants on board serve gourmet meals whether it is international fare or regional specialties. There is the elegant Compass Rose Restaurant, the more casual La Veranda, the classic steak restaurant, Prime 7, and the Pool Grill for something between meals. And of course you can always treat yourself to a coffee or a snack at one of the six bars or lounges. In the Seven Seas Lounge, which is built like a theatre, you can expect phenomenal shows such as musicals, and cabaret all performed by Regent's own nine-piece orchestra. Then afterwards drop by the Galileo's where you can have enjoy a drink and unwind. Or you can try your luck at blackjack in the ship's casino. The ship’s library is an inviting place where you can read a book in a quiet, relaxed atmosphere, play a game of chess or rent a DVD. Enjoy a glass of rare, vintage cognac and a fine cigar at the Connoisseur Club. The pool deck features a heated pool, two hot tubs and sun loungers. Destination Services allows you to book score excursions and experiences to really get the most out your destinations. If you want to be pampered on board, visit the Spa Club where you are offered exclusive, high-quality treatments by trained staff. To keep in shape, visit the gym where you can even sign up for a personal trainer. There is an exceptional butler service available for those in the following suite categories: Penthouse, Navigator, Grand and Master Suite. During the daytime it is permissible to wear casual attire however in the evenings and during mealtimes it is recommended that one wears more formal clothing. We recommend men wear a suit and women wear an evening dress.